Created in 1997, Kananaskis.com is one of the longest established local travel directory websites for Kananaskis Country, Canmore, Bragg Creek and surrounding areas in the Canadian Rockies. Our focus is to provide visitors with quality vacation planning information including recommended accommodations, activities and services for Kananaskis Country and surrounding areas including Canmore, Banff & Lake Louise and Bragg Creek. Our advertisers benefit from qualified exposure and targeted website traffic through directory listings, banner ads or a combination of both. Kananaskis.com is used by consumers searching for information about accommodations, activities and services in the area. Directory Listings are must-have entry-level advertising opportunity for business and organizations offering services in the area. They are one of the most effective ways of advertising on the site and engage consumers. They display in a random order to give all advertisers a fair chances at good placement. Featured Directory Listings are a targeted, effective and affordable way to advertise your business to potential customers. Your Featured Directory Listing is placed ahead of Basic Listings and is enhanced with 4 photos, description, click to call, maps link, website link, special offers link (if available) and links to your social media pages. 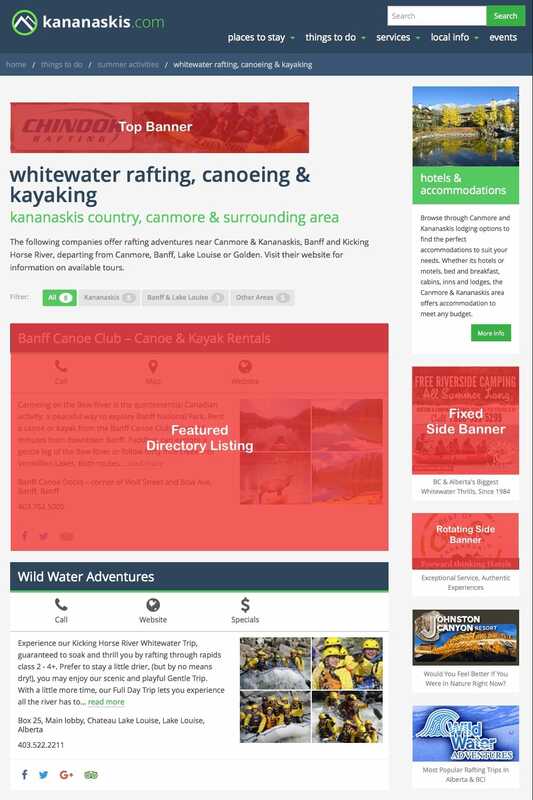 Basic Directory Listings provide basic information to Kananaskis.com visitors and include a description, your business location and phone number. 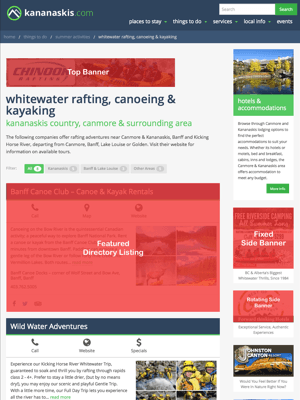 Banner Ads provide a great way to extend your reach on Kananaskis.com and complement your directory listings through strategic placement on pages. Banner Ad options include top of page horizontal banners, fixed side banner ads and rotating (run-of-site) banners. They are ideal for promotions, special offers, or create interest about a unique selling feature.